Christ walking on water to the rescue of the disciples. The image To the Rescue is comprised of the actual water, waves, and light reflections that Robert photographed of the Sea of Galilee. This piece is similar in composition to a painting by Russian artist Julius Von Klever. While many are familiar with lesson we learn from Peter when he becomes afraid walking on water, this image is focused on what happened before that. 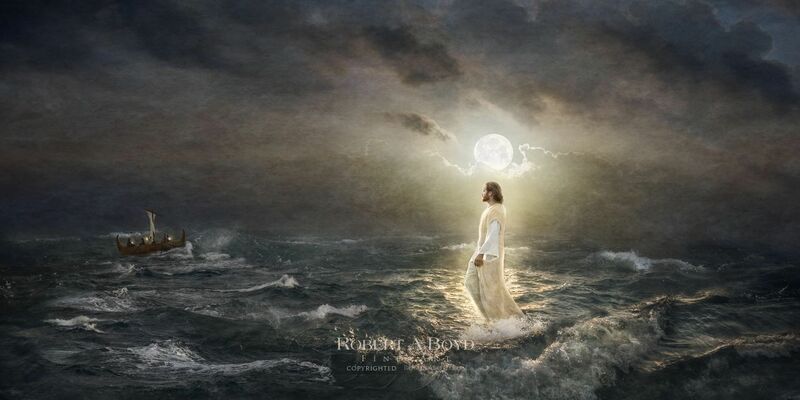 The Lord had observed his disciples on the water throughout the night, watching them struggle to cross the water in the storm, before he finally comes to the rescue in the fourth watch, the last period of the night before dawn. No doubt there are lessons we can learn from this, especially in our own lives. Sometimes we have trials, almost unbearable, and we pray the Lord will quickly deliver us. And sometimes we ARE delivered quickly, but other times the Lord waits, allowing us to "weather the storm." He is watching and keeping an eye on us. He knows the lessons and growth that lie in store for us, and so he waits and watches.